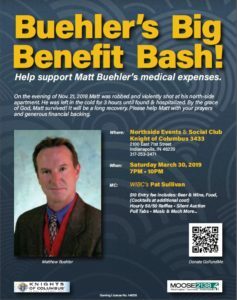 As you may be already aware, our beloved Brother and friend, Matthew Buehler, was seriously injured on November 21st, 2018. Matt was shot in the face, while being mugged outside his Castleton apartment. To date, Matt has been in the hospital for over six weeks and has had 4 surgeries, with more to come. When released from the hospital, Matt will be going to a rehab facility. Matt will be there for an extended stay, as he continues to recover. Matt is a Past Grand Knight at Council #3433. Still an Officer for the Council, Matt is currently Lecturer and leads the 1st Degree Initiation Team for the Council. Matt is a Past Faithful Navigator of Bishop Chatard Assembly (4th Degree Sir Knights) and is Captain for the 4th Degree Exemplification Team. Matt also is a Past District Deputy with the Knights. Matt is very involved with Moose Lodge 2138, currently an Officer with the Moose, a Trustee. As those that know Matt are aware, Matt has been a tireless worker in both the Knights of Columbus and with the Moose Lodge. He has consistently donated his time and energy in support of these organizations. NOW IT IS OUR TURN TO HELP HIM!!! The Knights of Columbus Council #3433 and Moose Lodge #2138 are partnering to help Matt. A fundraiser is being planned for March 30th, 2019 (at Council #3433, 2100 E. 71st St.) to help offset some of the major expenses that he is incurring. Matt will require “skilled nursing care,” due to his injuries to his throat. Feel free to contact Bill Aiken for additional information at: wwaiken2@yahoo.com or 317-408-9717.